This product has not authorized any other shop, please look for our brand "Jinson". About Jinson Jinson is a new online fashion brand with satisfied customers worldwide.Satisfied customers are what we aim for! OUR CREED To give you such outstanding quality, value, service and guarantee that we may be worthy of your high esteem. OUR GUARANTEE Every item we sell will give you complete satisfaction or you may return it for a full refund. Designed • Maternity style down to a tee! 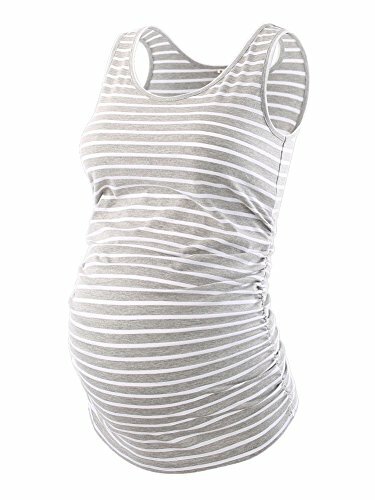 • Thanks to its super soft cotton blend fabric and side shirring,designed to accommodate your growing bump! 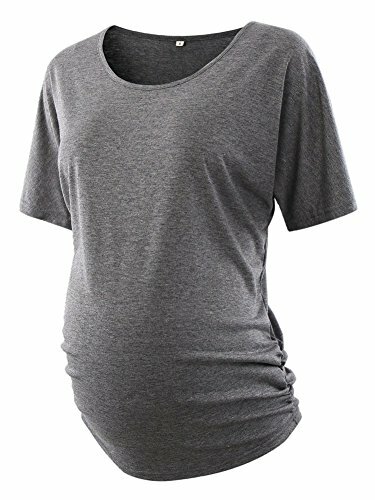 •A cute and chic top to feel and look great during pregnancy. •Never a truer maternity wardrobe staple. This design perfectly fuses substance with ease. The styling options are endless but the result always remains the same: understated yet chic. 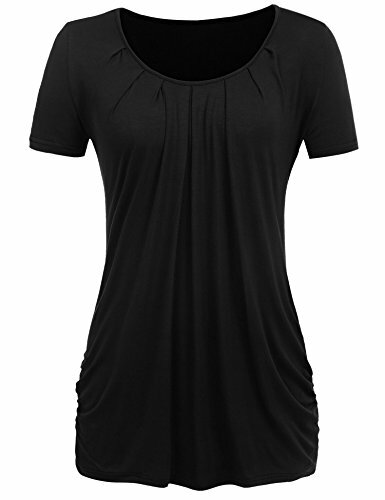 Features • Short sleeve,Side ruched,Stripe,Scoop neck,Basic Tunic，Slim fitted,Solid,Stretch well. 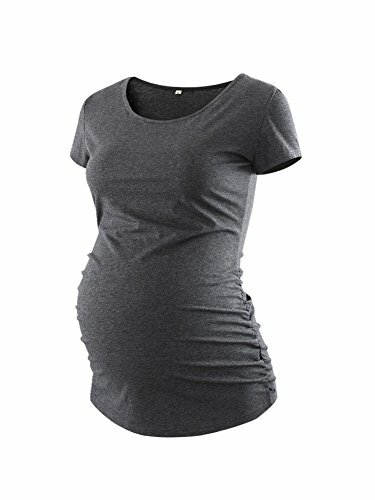 • This style works particularly well during pregnancy and post pregnancy. • Technically designed to embrace your changing body Notes • Before you buy it please allow 1-2cm difference due to manual measurement. Laksmi Womens Casual Round Neck Sleeveless/Short Sleeve Chiffon Hem Fit and Flare Flowy Tunic Tops Features:-Casual Chiffon Lace Knitting Flattering Tunic Shirts -Special Design Scoop Neck Swing Blouse Tops-Vintage Chiffon Hem A Line Stretchy Tops -Fashion Summer Fit and Flare Pullover Shirts-Short Sleeve/Sleeveless Daily Office Wear Chiffon Stitching Swing Tunic Tops #23 Size Info(in inch): M:----Length--28.0" Shoulder-- 14.6" Bust--37.0" Hem--50.8" L:----Length--28.7" Shoulder-- 15.0" Bust--39.4" Hem--53.1" XL:---Length--29.5" Shoulder-- 15.4" Bust--41.7" Hem--55.5" XXL:--Length--30.3" Shoulder-- 15.7" Bust--44.1" Hem--57.9" #04 Size Info(in inch):M:----Length: 31.9"/ Shoulder: 15.2" / Bust: 35.4" /Hem: 51.6" / Sleeve:7.3" / Cuff:12.4"L: ---- Length: 32.4"/ Shoulder: 15.7" / Bust: 37.4" /Hem: 53.5" / Sleeve:7.5" / Cuff:13.0"XL:---- Length: 32.8"/ Shoulder: 16.2" / Bust: 39.8" /Hem: 55.9" / Sleeve:7.8" / Cuff:13.5" XXL:---- Length:33.3"/Shoulder:16.7"/Bust: 42.1" /Hem: 58.3" / Sleeve:8.0" / Cuff:14.1"About us: This product is sold exclusively by Laksmi. Only buy from Laksmi to get genuine products with high quality and superb customer service. Laksmi trademark is protected by US Trademark Law. 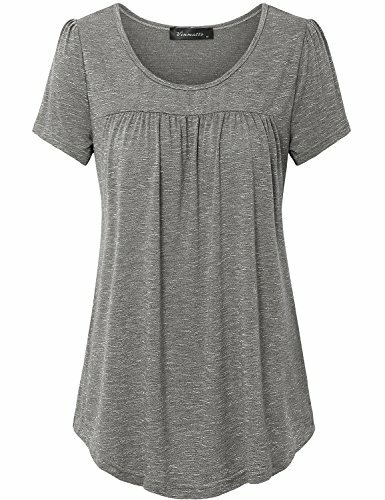 About Pinkydot Pinkydot Women's Flowy Dolman Maternity Tunic Tops Mama Shirt Ruched Batwing Short Sleeve Scoop Neck T Shirt Pregnancy Shirt Pinkydot is a new online fashion maternity clothes brand with satisfied customers worldwide. Satisfied customers are what we aim for! Every item we sell will give you complete satisfaction or you may return it for a full refund. 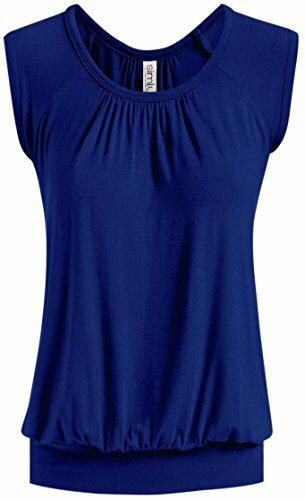 "This classic, stylish, simple, chic and delightful sleeveless tunic top is cool for summer. 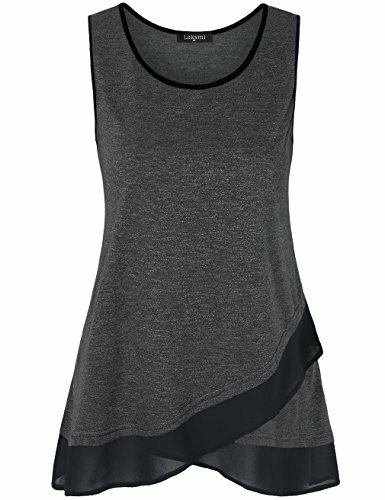 unique design summer tops. 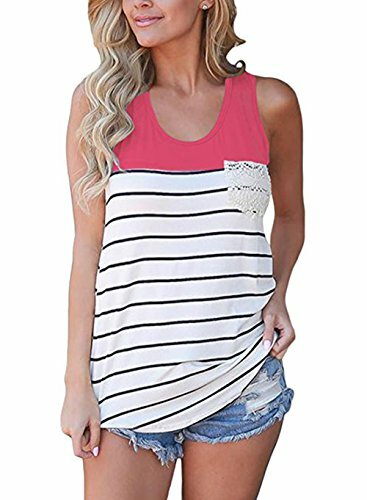 Colorblock neckline, white and black striped with lace pocket. It's great perfect for daily wear, school, work, exercise, hiking, beach and vacation in summer. 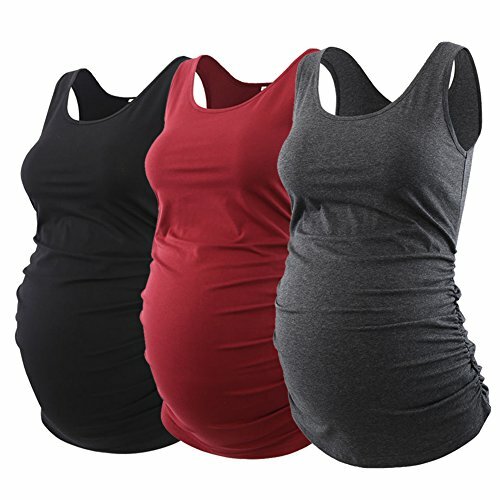 Size imformation: Size: S　Chest:33.8in/86cm，　Length:26.4in/67cm Size: M　Chest:36.2in/92cm，　Length:26.8in/68cm Size: L　Chest:38.5in/98cm，　Length:27.2in/69cm Size: XL　Chest:40.9in/104cm，　Length:27.6in/70cm Size: XXL　Chest:43.3in/110cm，　Length:28in/71cm"
Copyright © Wholesalion.com 2019 - The Best Prices On Soft Ruched Scoop Neck Top Online.